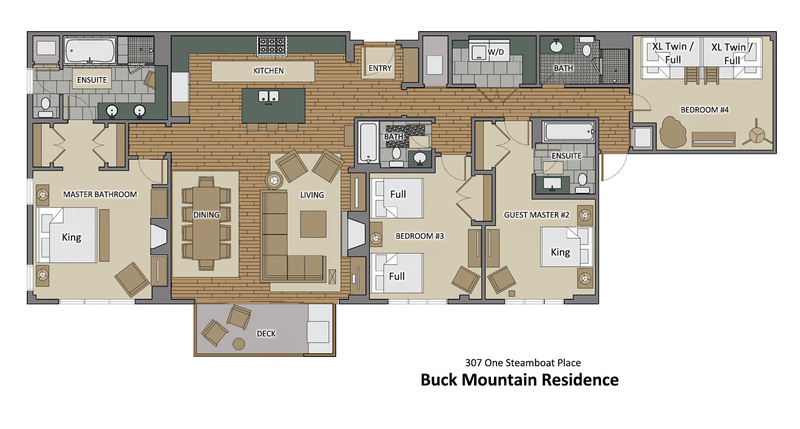 The Buck Mountain Residence at One Steamboat Place offers luxury accommodations with great valley views over the heated swimming pool. OSP has a premier location adjacent to the Steamboat Gondola so guests have unparalleled access to the ski mountain. This private OSP residence features a large living area overlooking the heated pool with open valley views. The open floor plan connects the living and dining areas to the kitchen with space for the entire group to gather. All One Steamboat Place residences feature rich colors, natural textures, and sumptuous fabrics throughout the home. Each master bedroom offers a gas fireplace and large LCD TV. The main master bath features a steam shower and Jacuzzi tub. In this residence 2 bedrooms offer a King bed with private bath. The third bedroom offers two Full beds. The fourth bedroom offers two sets of bunks with Twin bed over a Full bed. This room is beautifully outfitted with built-in cupboards and a large flat screen TV and X-Box video game system. Kids will love it! All bedrooms have a private bathroom. The residence also includes an iMac home computer and high speed Wi-Fi throughout allowing Internet service for all guests. A printer is available at the front desk and guests can also videoconference with the front desk from the home office. Great looking property overall with outstanding amenities. Close to shopping and restaurants. Would definitely consider this for family or more private trips. I had an amazing time during my vacation to Steamboat Springs. The Buck Mountain unit was incredible. It is in a fantastic location, has every amenity you can possibly think of, and most importantly, is directly adjacent to the pool/spa area. It was my first time visiting, and the entire staff at One Steamboat Place could not have been more helpful and accommodating. They were always friendly and really made for an incredible stay. I really cannot say enough great things about my vacation experience. This was our first trip to Colorado in the summer and it could not have been better. After a day of fly fishing, rafting, tubing and hiking it was fantastic to come home to One Steamboat Place. We were always greeted at the front door by Hunter and the other friendly staff members who where very helpful with arranging activities, restaurant reservations and transport with the complimentary SUV service. The unit itself is incredibly spacious, comfortable and beautifully decorated. My wife wondered if Ralph Lauren had a hand in the decorative process because everything is so well put together. We also took advantage of the well stocked gourmet kitchen and outdoor grill cooking at home many nights. One of our favorite things was relaxing on the balcony. There is a direct view of the pool so we could just hang out and watch the kids swim. Our two boys also loved the game room with the ping pong, billiards and shuffle board. We also enjoyed eating at the Truffled Pig next door. The food was great and watching the humming birds fly around the hanging flower pots was terrific. The property is at the base of Steamboat mountain just steps from the gondola. We are planning to forgo our regular ski trip to Aspen this year and come back here instead. Some of the nicest amenities of any Ski in/ Ski out Condominium that I have ever experienced. This 4 bedroom Condo has it all. It has spacious bedrooms and common space as well as a large kitchen. The bunk bed room is great for kids as well. The other services including a ski concierge who takes your skis in the afternoon and has them ready for you in the morning is truly a treat. A full service spa, sauna, weight room with treadmills and elliptical machines as well as outdoor pool and hot tubs make this a great way to unwind. Apres ski with food, drinks, and music is a plus. They even have a personalized shuttle service that will take you to town and pick you up. Could not be better. I highly recommend it.